It’s been raining here all day. I was so thrilled when a little bit of sunshine shone through into my dining room, so I could snap a pic of today’s lunch for you. Still, I am not terribly pleased with how these pictures turned out. This meal was so delicious. I don’t think they really do it justice. You’ll just have to take my word for how good they are. In a colander drain 1/2 cup of the prepared salsa. Seed and finely chop half of the jalapeno, thinly slice the remaining half. In a large bowl mash beans with a vegetable masher or fork. Stir in muffin mix, drained salsa, 1 1/2 tablespoons chili powder, and chopped jalapeno. In a large skillet, heat 1 tablespoon oil over medium-high heat. Add four 1/2 cup mounds bean mixture to skillet. Flatten mounds with spatula to 3 1/2 inch-round cakes. Cook 3 minutes on each side until browned. Remove from skillet and repeat with remaining oil and bean mixture. Optionally, top with additional salsa, sliced jalapeno, and sour cream. Enjoy! My grocery store sells a fantastic fresh salsa in the product department. I hardly ever make my own salsa since discovering it. Feel free to make your own fresh salsa for this recipe, especially if your garden is overflowing with tomatoes this summer. I slightly altered the BH&G Magazine recipe to add a little more zest. If you like this recipe, you might also enjoy these Taco Stuffed Zucchini Boats and Cheeseburger Soup recipes. What are some of your favorite vegetarian recipes? « What’s in my bag this spring? OMG, those sound amazing. I definitely want to make these for my family! We are a family of carnivores, so we don’t have any truly vegetarian dishes. We do enjoy lots of different veggies as sides, though. I think I would love this. However I’m not sure my family would. Wow this sounds amazing. I haven’t ever tried anything with black beans before. This looks. Super tasty! These look really good! My kids love black beans so I bet they would love these. That would be so good, especially with the jalepenos. My daughter got me into black beans. That looks so yummy! I’ve been looking for something good for Meatless Mondays! Thanks for sharing! I am so excited to try a new way to use corn muffin mix. I will be pinning these and making them for our next taco night! These sound really good! We’re often looking for meatless options, so I’ll have to give this recipe a try. These sound really good. They would be perfect for meatless Monday at our house! I love black beans. This looks amazing! I love black beans and anything Mexican inspired. Oh my goodness that looks awesome! I’m going to use this recipe for our Meatless Mondays! 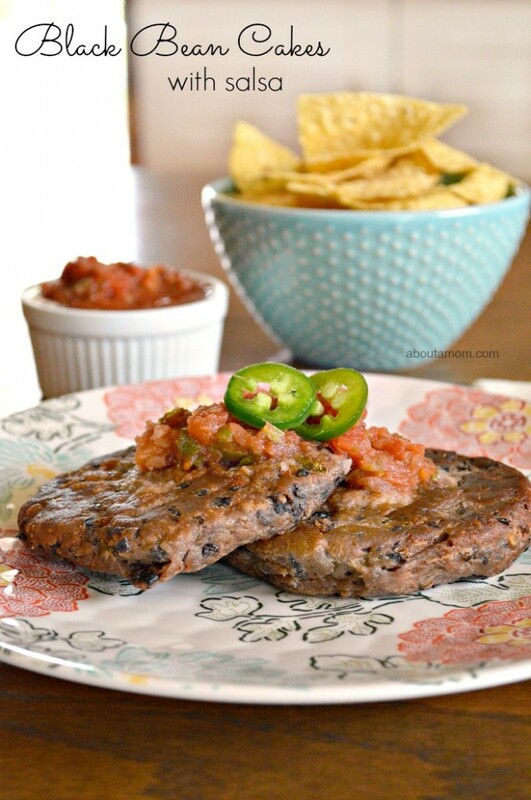 I can’t wait to try these black bean cakes with salsa. I think they will be delicious for tomorrow night’s meal – or maybe even lunch! I’m headed over to look at the taco stuffed zucchini boats right now. We harvest a lot of zucchini over the summer. These look so delicious i cant wait to try them. I will have to make them this weekend. I am sure my family will love them. Oh those look good! Not sure I can do the jalapeño option, but will have to try them without. yummy! Mmm, this looks pretty yummy. I love black beans, so this is perfect. I haven’t heard of black bean cakes. Glad the sun peeked out for you to get the pic. I do like black beans. I think these would be great to serve on the weekend. Looks so good! 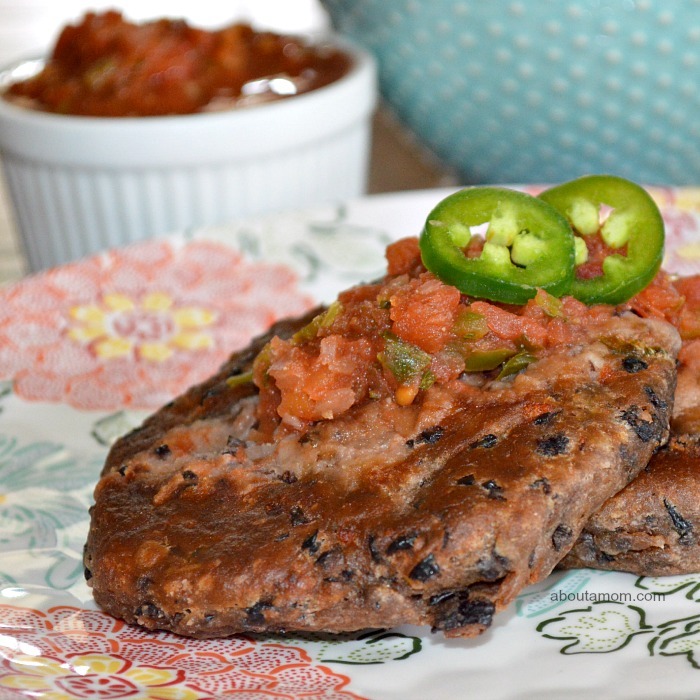 I’ll have to try these black bean cakes! I want to try this. I’m trying to include more meatless recipes. I think my family would like this. I love eating beans and cooking with beans. I will give it a try.